Relax and enjoy fine American grill cuisine in our Flagstone's Restaurant, offering you fresh made breakfast, lunch, and dinner all passionately prepared by our Executive Chef. For breakfast, you will indulge in our award-winning buffet. 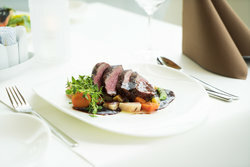 Enjoy satiating fine dining specials and creative, delectable fare throughout the day. The menu includes everything from expertly executed pasta dishes to hearty steak dinners. Flagstone's restaurant Suffern offers all of your casual favorites too! Do not miss their bacon avocado burger or black pepper and garlic chicken wings. Despite the opulent decor, the attire is casual, so you can feel comfortable stopping in for a bite to eat after a long day of sightseeing or business meetings. 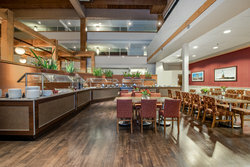 Crowne Plaza Suffern - Mahwah's restaurant is open daily, however, the hours of operation do vary between weekdays and weekends. Whether your preference is for a light snack or an elaborate dinner, let us bring the food to you! Enjoy the convenience of picking up the phone and having our staff deliver the meal of your choice to you in the comfort of your 7 layers of plush comfort bedding. Relax and enjoy fine American grill cuisine, in our Flagstones Restaurant offering a fresh made breakfast, lunch or fine dining specials prepared carefully by our Executive Chef. Open daily, attire is casual. Call for reservations 845-357-4800 x 514. A stay with us means you never have to worry about going hungry because we offer you the supreme convenience of delectable on-site cuisine. 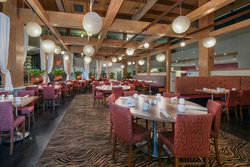 Flagstone’s, our on-site restaurant, is open for 3 meals a day. The menu consists of all of your casual favorites, along with heart steak dinners and rich pasta dishes. Enjoy fine American grill cuisine throughout your stay! Breakfast is served between the hours of 6:30 a.m. and 10:30 a.m.